This antibody is expected to recognise isoform 3 (NP_001614.3) only. 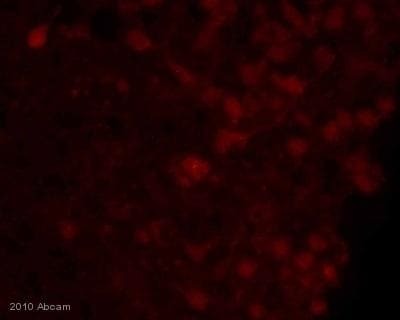 This antibody gave excellent staining in paraffin embedded human adult tissue and embyronic rat tissue. For WB, we recommend blocking in 3-5% milk, NOT BSA. Blocking in BSA gives high background. WB: Recombinant Human Iba1 protein (ab117478), Human peripheral blood mononucleocyte and frontal cortex lysate. IHC-P: Mouse brain; Human placenta and jejunum; rat embryonic liver tissue. Our Abpromise guarantee covers the use of ab48004 in the following tested applications. WB Use a concentration of 0.5 - 1.5 µg/ml. Detects a band of approximately 17 kDa (predicted molecular weight: 17 kDa). We recommend blocking in 3-5% milk, not BSA. Blocking in BSA gives high background in WB. 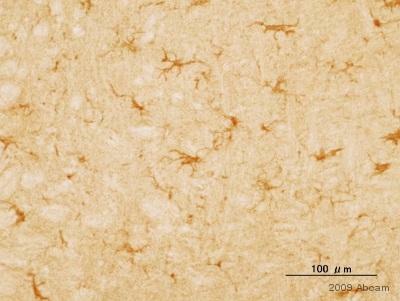 Paraffin embedded mouse brain tissue stained for Iba1 with ab48004 (2 µg/ml) in immunohistochemical analysis. Steamed antigen retrieval with citrate buffer pH 6, HRP-staining. 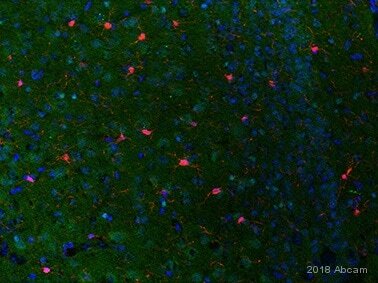 Paraformaldehyde fixed mouse brain tissue stained for Iba1 with ab48004 (1/200 dilution) in immunohistochemical analysis. Secondary: Donkey Anti-Goat IgG Cy3® (1/500 dilution). Additional bands at: 110 kDa, 35 kDa. We are unsure as to the identity of these extra bands. ab48004 at 1/300 staining human jejunum tissue sections by IHC-P. A heat mediated antigen retrieval step in citric acid buffer was performed and the tissue was blocked in BSA before incubation with the antibody for 2 hours. 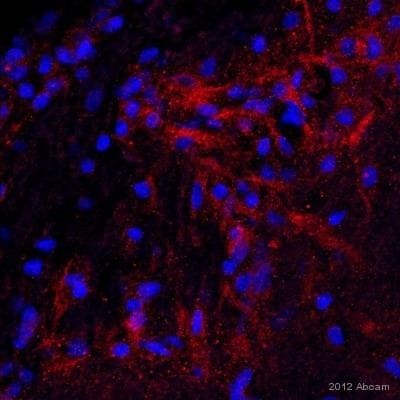 A biotinylated rabbit anti-goat antibody was used as the secondary. ab48004 diluted 1/200 with TBS/BSA/Azide staining rat d15 embryonic liver tissue sections by IHC-P. The tissue was formaldehyde fixed and a heat-mediated antigen retrieval step in citric acid buffer at pH6 was performed prior to blocking with 1% BSA for 10 minutes at room temperature. Incubation time with the primary antibody was 16 minutes. A biotinylated rabbit anti-goat was used as the secondary. Paraffin embedded human placenta tissue stained for Iba1 with ab48004 (2.5 µg/ml) in immunohistochemical analysis. A heat mediated antigen retrieval step in citric acid buffer (pH 6) was performed. Publishing research using ab48004? Please let us know so that we can cite the reference in this datasheet. Please find answers in attachment. The experiment was carried out on male Wistar rat (250g). Rat was operated on chronic constriction of the sciatic nerve as a model of neuropathic pain by Benett and Xie. The rat spinal cord was dissected and fixed in Zamboni’s fixative (4% paraformaldehyde in PBS) at 48ºC overnight. The sample was then washed in 10% - 20% phosphate-buffered sucrose for 12 h and cut to cryostat sections (12µm). Sectoins were blocked in Normal Donkey serum and incubated with antibody Iba-1 (1:200-1:50 – using diluent DAKO c. no. S3022) for 240min.- 24hr. at room temperature. Secondary antibody Donkey anti Goat was applied with a final dilution of 1:100 (1:400) for 90 min at room temperature. Secondary antibody was conjugated with FITC (or Alexa 488). Thank you for your enquiry regarding ab48004 and for taking the time to provide some useful details of the experiments. I am very sorry to hear that your customer is having problems with this antibody. As the datasheet indicates under the Specificity section, this antibody is expected to recognise isoform 3 (NP_001614.3) only. It gave excellent staining in paraffin embedded human adult tissue and embyronic rat tissue. 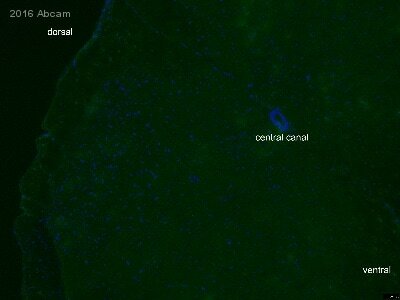 However, adult rat/mouse brain microglia and adult/embryonic mouse non-neuronal macrophages staining was very faint compared to another Iba1 antibody. 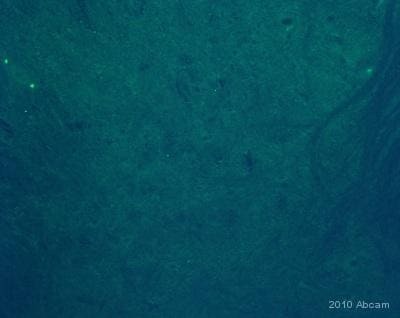 1) Main questions: Are the samples from rat spinal cord from adult, if so at what age? This seems to be an important piece of information. 2) What percentage normal Donkey serum was used for blocking? At what temperature and for how long? 3) Does the detection system work fine? Have you used it successfully with another primary antibody? 5) Has the customer got any preliminary data or specific published papers to confirm that chronic constriction of the sciatic nerve could induce Iba1 expression? Could you please explain and specify the paper you are referring to (by Benett and Xie)? The tissue I used was rabbit brain tissue. We are specifically looking at cortex. The tissue was harvested via trans cardinal perfusion with PBS and followed by 4% PFA. We then do a 24 hour post fix in the 4% at 4C. After the post fix we put the tissue in HBHS buffer. Our IHC protocol includes a 30min incubation in NaBH4 to expose the antigens, a 30min incubation in Triton X-100 to lyse the membrane, a 30min incubation in hydrogen peroxide to block endogenous peroxidases and then a 30 min incubation in Image-iT FX to block background staining. The sections are 200 um thick and we incubate the tissues with the antibody over night at room temp on a shaker. We do not do an antigen retriever right now but that might be worth looking into. Your protocol seems comprehensive, although I would strongly recommend including the antigen retrieval step since this has worked well for other customers. We would recommend citrate buffer pH 6, which we do sell as ab64214. If you're looking for an antigen retrieval protocol, we have some online as well. If you do try the antigen retrieval step and still see no staining, I would be happy to replace or refund the product for you. I'ved been conduction an IHC experiment using ab48004 with a donkey anti-goat 488 on rabbit tissue and haven't been able to produce any staining. I've tried a variety of dilutions including the recommended 1:200. The species reactivity says that it reacts in rabbit so I'm not sure why I'm not being able to see any labeling. Would you be able to provide more information about the protocol that was tested? The antibody is guaranteed to work in rabbit, so if we can't figure out why it's not working we'd be happy to offer a replacement or refund. Were the tissues paraffin-embedded (IHC-P) or frozen (IHC-Fr)? How were they fixed? This is a cytoplasmic protein, so was a permeabilization step included? If so, with which agent? Did you perform antigen retrieval? If so, with what buffer and how long? How long was the antibody incubated? We would generally recommend overnight at 4C. I look forward to receiving your reply so that we can help you further with this antibody. I would like to reassure you that ab48004 is tested and covered by our 6 month guarantee for use inWB and human samples. In the event that a product is not functioning in the applications cited on the product data sheet, we will be pleased to provide a credit note or free of charge replacement. Reviewing this case, I would like to offer some suggestions to help optimise the results from ab48004. 1.) Since there is no band, I can recommend to not use any blocking agent in the antibody solution. I also do not recommend to mix blocking agents and suggest to use BSA for blocking. 2.) I suggest to incubate the primary antibody over night at 4C to achieve full saturation. 3.) Maybe a more standard procedure in developing will give better results. maybe some form of ECL kit will improve the results. 4.) I can also suggest to use SDS in the lysis buffer to achieve complete recovery of the protein and to boil the samples for 10min before loading them on the gel. Is this method working with other primary antibodies in your lab? Is the secondary antibody functional? Are there any bands on the blot and is the loading control working?